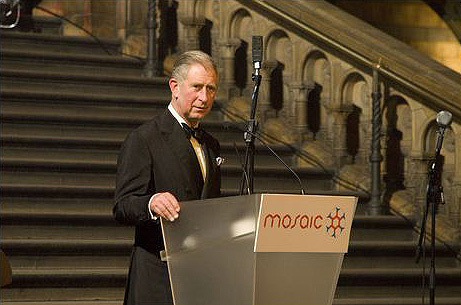 A British charity founded by HRH Prince Charles and has agreed a partnership with an international project highlighting the Muslim world’s contribution to science, technology and the arts. 1001 Inventions is global brand that recently launched a blockbuster exhibition at London’s Science Museum, and has now agreed to work with the Mosaic initiatives founded by the Prince of Wales. The Mosaic charity is chaired by HRH Princess Badiya bint El Hassan of Jordan, and works to inspire young British Muslims aged 12 to 25 to overcome social and economic barriers to success. However, many of their projects can and do benefit non-Muslims living in the areas where the charity operates. such as London, the Midlands and Yorkshire. Currently, Mosaic has arrangements in place with more than 50 UK schools to provide mentoring, support and exclusive educational opportunities to their students. 1001 Inventions, a British-based educational initiative, has enjoyed recent success with the launch of a blockbuster exhibition at the Science Museum in London. More than 60,000 visitors rushed to see the exhibition during its first six weeks of opening, and it’s expected that more than a quarter of a million will have experienced this historic showcase before it closes in summer 2010. The first cooperation between the two organisations is expected to be for the national Young Inventors competition that is being run by 1001 Inventions during the summer term. The competition will provide prizes to youngsters who suggest innovative ways of dealing with modern problems like pollution, transport congestion and rising obesity.